If your lunch plans included throwing a Banquet meal in the microwave, you might want to make sure the chicken nugget tray doesn’t include a brownie, as the sweet treat may contain Salmonella bacteria. Conagra Foods posted a notice with the U.S. Department of Agriculture’s Food Safety and Inspection Services Thursday recalling 110,817 pounds of frozen chicken nugget meals. Conagra says it recalled the products out of an abundance of caution after being notified by an unnamed supplier that an ingredient used in the brownie mix may be contaminated with Salmonella. It’s unclear what ingredient in the brownie mix could be contaminated or where the material came from. 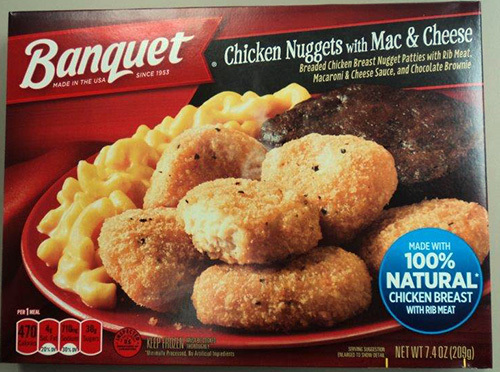 The affected Banquet Chicken Nuggets with Mac & Cheese products come in 7.4-ounce trays with code 3100080921 and a Best If Used By date of July 20, 2018. The products also have the establishment number “P-9” printed on the side of the box. To date, Conagra is unaware of any reports of adverse reactions in anyone who has eaten one of these meals.